Not to be confused with The Endless Not. “The Eternal Knot” redirects here. For the 2001 classical album, see Adiemus IV: The Eternal Knot. More complex form seen on ca. 400 year old Chinese lacquerware dish. 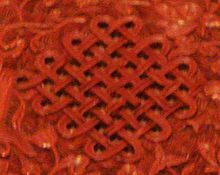 The endless knot or eternal knot (Sanskrit: Shrivatsa; Tibetan Dpal be’u) is a symbolic knot and one of the Eight Auspicious Symbols. It is an important cultural marker in places significantly influenced by Tibetan Buddhism such as Tibet, Mongolia, Tuva, Kalmykia, and Buryatia. It is also sometimes found in Chinese art and used in Chinese knots. 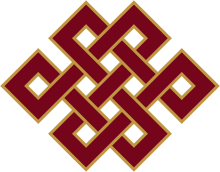 See 7₄ knot for decorations or symbols in other cultures which are topologically equivalent to the interlaced form of the simplest version of the Buddhist endless knot.